I had this orchid that I needed to re pot, so I cleaned the pot it was in. I painted it white, now I just needed to figure out how to start the string. So I took the end of the clothesline, and from the top of pot, I threaded through one of the holes in the bottom. If you don’t have a hole in the bottom of the pot, you can just drill one. It will also serve as the water drainage. So I threaded it down the pot to bottom, then up, then back down and tied it to itself. You can also start at the rim of the pot by adding glue all around the top of the pot. I used Gorilla Glue Clear for outdoors/indoors. Be sure to use a outdoor glue. Hot glue will melt in the heat. The instructions say to let the glue stick for 3 minutes before applying, so I had some free time to get my other project going. More of that one later.I then applied the string all along the rim on top of the glue. Notice I didn’t paint the inside of the pot. I try not to. I don’t want my soil or plant living with it.What I did to make it easier to wrap around was put a strip of the glue vertically up three sides. I then started wrapping the string around the pot and kept on going until you get to the bottom. Isn’t this pretty? 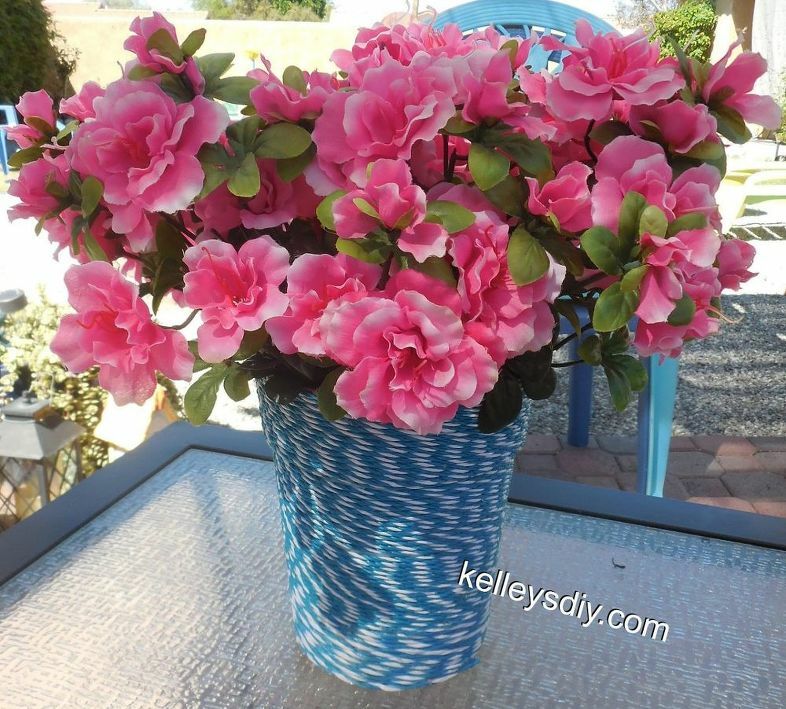 Wouldn’t it look really pretty with some red/white and yellow/white stripped string….so summery! Enter your name and email address where we can reach you! Good luck! Thank you!!! Be sure to sign up for this months giveaway! Thank you…Have a wonderful day!